Sounds like some very good Fourth of July plans! Nothing beats the Fourth in DC. Also, I can't believe its been two years since Dukester's wedding! So awesome to see those pics again. Nick and I headed upstate to two different cousin graduation parties and all around family fantastic-ness. There is something about getting out of the city to get together with family to eat, drink, and laugh (a lot) that its so rejuvenating! It also doesn't hurt that it's pitch dark when you turn off the lights to go to sleep up there and sooo quiet. I love that. 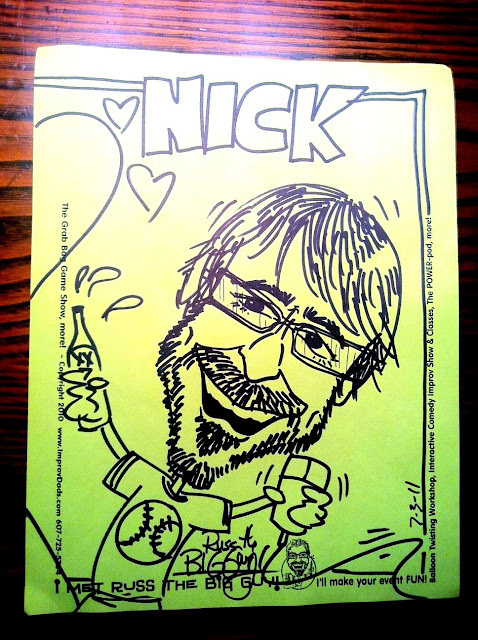 Nick's iconography includes hearts (because we asked to be drawn as a couple? ), a beer, a baseball t-shirt and a computer mouse. HA! Had to share. We got home kinda late last night, but there was just enough time for me and Nick to grab a couple of slices and catch the fireworks over the Hudson River. The weather was freakin' gorgeous with just enough of a cool breeze and the most wonderful sunset. Check out some photos of the sunset here. So glad we did this! More to come this week -- including another Phone-A-Friend!